Wellington, FL (August 26, 2013) – The public is invited to “turn their trash into cash” as the Courtyard Shops at Wellingtonlaunches its “Shred-4-Ed” program to support community education at area schools by donating funds for each container brought to free monthly shredding sessions, held from 10 a.m. to 1 p.m. in the center parking lot on the last Saturday of each month, specifically August 31st, September 28th and October 26th. 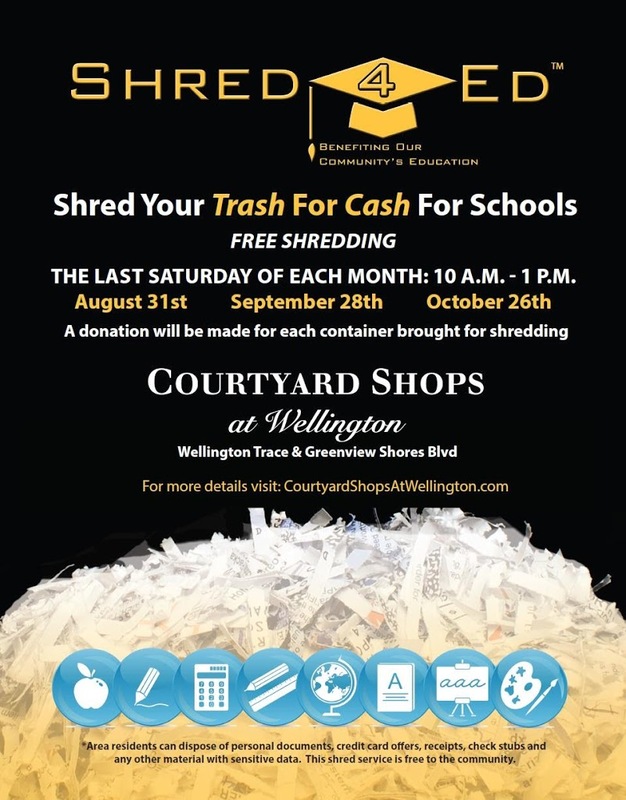 Area residents and businesses can use this program to discard unwanted clutter and gain peace of mind by safely disposing of personal documents, credit card offers, receipts, check stubs, any other material with sensitive data, all at no charge, with a donation to a local school of their choosing made by Courtyard Shops at Wellington for each container they bring to be shredded. In appreciation, each supporter of community education will receive special offers, and other promotional items provided by Courtyard Shops at Wellington’s diverse collection of more than 30 stores and restaurants that are featuring special sales, samplings, demos, discounts, and more during the program session days. Conveniently located at 13860 Wellington Trace in Wellington at the corner of Wellington Trace and Greenview Shores Blvd, the Courtyard Shops at Wellington is a retail destination with more than 30 shops and restaurants including Publix, Kontiki, Van Dell Jewelers, Eyes of Wellington, Lindburgers Restaurant, Tijuana Flats and Sam Jon’s. 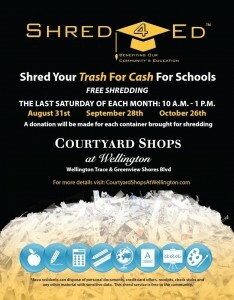 For more information on the “Shred-4-Ed” program, visit courtyardshopsatwellington.com, become a fan at facebook.com/courtyardshopswellington or call (561) 347-6521.